Would the new “Joe Flacco Pass” be stroller friendly? Yes, the existing parts of the trail are stroller and wheelchair friendly so presumably all connections between trails would be as well. The shared path generally works well for everyone except in the Inner Harbor where strollers, tourists, etc. don’t mix well with bicyclists. Comeback City advocates for a separate cycletrack on Pratt from MLK to President and on to Inner Harbor East in this hyper dense part of the trail network. The lower Patapsco valley is a densely wooded, but w/o any linear trails through it. A hard surface trail, as proposed, would be a welcome addition and spur use of a chunk of state park land that sees very few visitors. 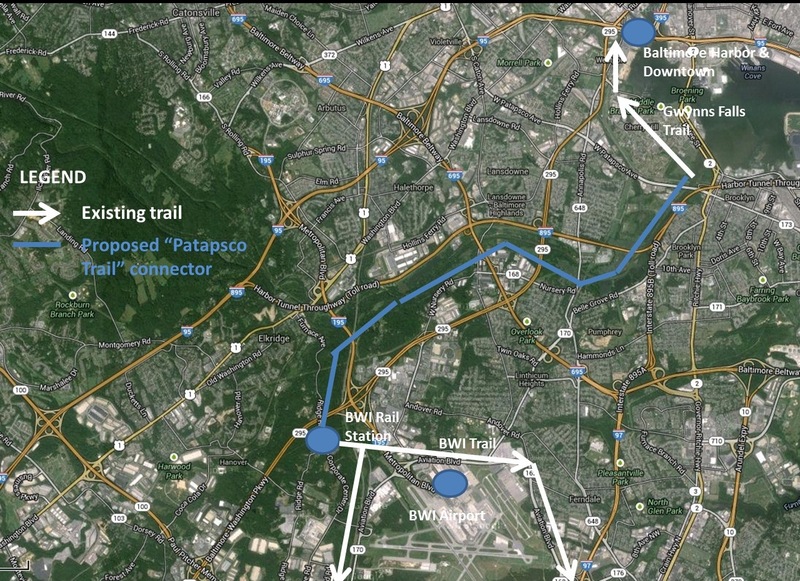 I think the logical connector into the downtown section would be to follow the light rail route from somewhere around Patapsco Ave into downtown. Not a criticism of the idea, but the reason that area isn’t developed already is the fact that it is very low-lying and marshy. A trail in the area indicated would require many bridges and probably causeway or boardwalk sections. A route that more closely follows existing roadways might be more practical. Yes, much of the Patapsco Valley is low-lying and marshy. I was speaking with a bike planner last week and he suggested some environmental concerns as well. Google earth images of the valley show a handful of what look like service roads/paths in the valley so I think a big part of the valley could work and where it doesn’t, the trail could divert toward higher/developed ground. Whatever the route, I hope it happens and it is a balance between access to nearby neighborhoods, a useful (somewhat direct) commute route, and comprises some scenic sections. Obviously, the river valley provides the most scenery, maybe the easiest ROW, but has environmental considerations. The route along the Patapsco River would be ideal. Yes, there will be some bridges over streams and culverts required. The number of bridges can be greatly reduced by locating the bike path on higher ground further away from the river in places where that can be done. An inspired and carefully-chosen route will be enjoyable for hiking, bicycling and bird watching. Every I drive from Baltimore to DC I think how does the Parkway (295) not have a hiker/biker trail going down some of the rather large sections that are not intersected by overpasses. Interesting piece about connecting AA County Trails.